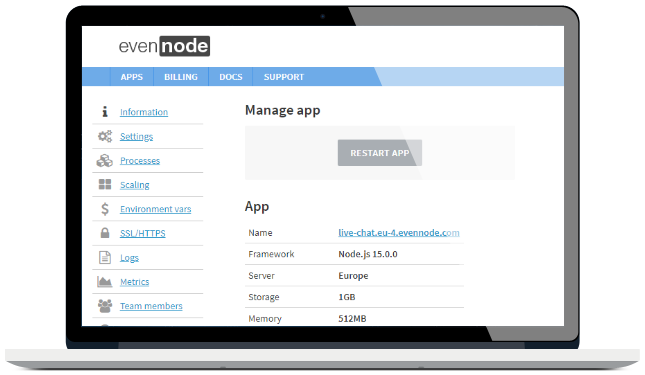 Run and scale your Node.js or Python app in the cloud. We take care of high availability, deployment workflow, metrics, error reporting and much more so that you focus on development. You get a free MongoDB database with every plan. We run a 3 member replica set with a primary, secondary and a backup member so that your data is always protected. WebSockets are supported out of the box. Run your favorite chat apps, REST API, games or event-driven workflows over a single TCP connection without having to use long polling. Conveniently upload your app over FTP or FTP with TLS/SSL. No need to learn git commands to deploy your app. Once a file is uploaded we automatically rebuild your app to deploy the most recent version. Use logs to detect bugs or to debug a pressing issue with your app. Everything that your app prints to stdout or stderr is logged and available to you via our web console. Get a free SSL certificate from Let's Encrypt for all your domains with most of our plans. The SSL certificate can be deployed with just few clicks and is renewed automatically before the expiration. Too much traffic? 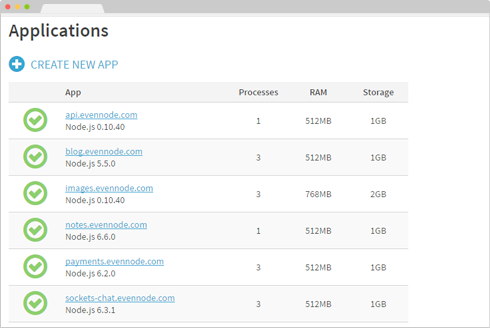 Easily scale the resources from our web console by upgrading your plan. Additional resources are available to you immediately after the upgrade so that you can handle all the traffic. Reach out to us if you need assistance with our platform. We'll be happy to help with configuration or app issues. EvenNode's pay as you go plans are billed monthly so that you only pay for what you really need. If you're not amazingly happy let us know and we'll give you a full refund up to 30–days after your purchase.